I don't have any relationship with Ziplock. Whenever I receive a free product or service, I will always let you know. I've been working harder this year on packing waste-free lunches. Plastic bags just don't get much use on a typical week in our house anymore. Still, when we travel I find them indispensable, and I always slide a couple (ideally in different sizes) into my suitcase. Ziplocks can be washed and reused over and over (buy the extra-sturdy freezer bags), so a few bags will go a long way. Here are some of the ways you can use a Ziplock bag when you travel. Want to carry something fragile and you don't have bubble wrap? Insert a straw into the top of a nearly closed Ziploc bag and inflate it. Remove the straw and seal the rest of the way to make a cushion. This isn't as fail safe as bubble wrap, but it works in a pinch. Need to do laundry on the road? Store some powdered laundry detergent in a ziplock bag and end your search for travel size detergent. Wet swimsuits. Need I say more? Prevent sandy beachwear from soiling everything in your luggage. Going to a foreign country? Put your home currency in a Ziplock while you travel (especially the coins) to keep it from mixing in with the foreign currency. Keep a large Ziplock in your daypack for wet umbrellas, rain jackets, or other items. Separate toys into Ziplocks so that you can find what your child needs - Legos in one, Polly Pockets in another and Playmobil figures in a third. Fill a Ziplock with crayons or markers. Using one bag per child works great. Keep one or two in your purse for those toddler snack bags that never seem to reclose. Use a Ziplock to hold ice for an impromptu baby milk cooler or an injury. You can almost always find ice on the road, but sometimes it's trickier to find a leak-proof bag. Give each child a Ziplock with their name on it to store the "treasures" they find when you're out and about. All those small rocks, twigs and seashells need to fit in their Ziplock. A ziplock makes a great drain plug, just fill it with a little water, and it becomes a weight that you can fit into the drain. Messy diapers don't have to stink up your bathroom until maid service arrives, ziplock bags work well for containing the smell. Dominique on November 8, 2010 at 3:01 p.m. I swear by zipper-closure plastic bags when traveling! I've use them as an impromptu "washing machine" (your tip #4) and for keeping cameras dry (your tip #11). We took one of those extreme speedboat tours in Chicago, and the two-gallon bags we had kept our cameras dry--even as we got drenched! It can be difficult to find two-gallon bags around town, but I've always been able to find them online. Kieron on November 8, 2010 at 3:08 p.m.
We've used Ziplock Bags when traveling before, but there are some great reasons here that I hadn't even thought of. #4 sounds a bit risky if you're flying though - unidentified white powder in a ziplock bag! But maybe that's just me being overly paranoid after visiting some Asian countries! Tracy Burns on November 8, 2010 at 4:21 p.m.
We swear by ziplock bags on the road too... for all those reasons you mentioned. We learnt the hard way on our first flight that kids medicines have a tendency to pop open mid flight and leak all through your pack - strawberry flavoured cough medicine is a pain to get out of clothes! Nowdays it gets ziplocked along with snacks, toys and just about everything else. Love your photo tip for kids (#17), never even thought of it. GBK Gwyneth on November 8, 2010 at 6:13 p.m. I too pack plenty of ziptop bags while traveling -- even though I don't use them otherwise! So versatile while we are traveling! So, while I don't keep them in the kitchen, I do keep the in my travel supplies spot! Kristina on November 8, 2010 at 9:07 p.m.
Yep, count me in among the zip lock fans. I pack almost all my clothes in them when I travel. They just keep everything organized. I've also tossed my cosmetic bag on my last couple of trips and just used ziplocks. It saves a lot of space! I've hade no problem finding the 2 gal size at Target. I use those at home and put all my wool and cashmere sweaters in them to keep them protected from moths. Debbie on November 8, 2010 at 9:26 p.m. I hadn't even considered packing my sweaters away in Ziplocks! What a great idea - I end up spending a fortune on reweaving every fall when I get the sweaters out. yatra on November 9, 2010 at 12:18 a.m.
ziplocks bags are very useful while travelling. Scotti on November 9, 2010 at 7:25 p.m. I always bring a few in different sizes with me. I've found them useful to separate the kids stuff in my carryon -- a small one for a little first-aid type kit with hand sanitizer, bandaids, lip balm, etc. Another benefit of #22 - keeps your bag sand-free when carting home beach treasures. In the past we've also had to bring specific snacks with us. For instance, finding healthy snacks that a picky eater will actually eat in Mexico has been a challenge (candy & chips everywhere!) so we bring some nuts, familiar crackers, cereal, etc. Then I use the ziplocs to keep it from getting stale in our hotel room once it's open - and to portion out day-trip sized packs. I've found the really big generic brand Ziploc bags at the Dollar Tree in the past. As for the laundry soap problem, I've started bringing a small travel size bottle of Dr. Bronner's soap with me. It's so multi-purpose that we can use it in the shower or to hand wash clothes as needed. Melanie on November 10, 2010 at 9:50 a.m. I LOVE travelling with Ziplocs! My husband calls me the Ziploc queen! I pack ANYTHING that could break or spill in a ziploc. I dont' have a toiletrie bag, I just use ziplocs. THen I know that my things are safe in my suitcase and I can see what is in what bag. When I send my step daughter to camp I do the same..and I categorize and write on the bag what is in it for her. To me they are indespensible! You gave me a couple of more ideas on how to use them! Thanx! Sonya on November 10, 2010 at 12:47 p.m. Thanks for these great Ziplock bag ideas for travel! Today, I included your blog in my "10 Family Travel Blogs You'll Love" post on TravelingGreener.com. Elizabeth McQueen on November 11, 2010 at 8:39 a.m.
Whoa! I hadn't thought about the many uses of ziploc bags until I read this post. We've mostly used them for snacks,crayons and medicines. Thanks for the tips! As we expand our traveling gypsy family, I know I'll be needing as many tips as possible. Debbie on November 11, 2010 at 8:44 a.m.
Great ideas! I think we're up to 25 now. Plus as I was packing for yet another trip yesterday, I realized that I omitted one - limit the number of toys in your child's carryon bag. I give Darya one quart size bag for calico critters and one for polly pockets. That amount gives her plenty of play options without being too cumbersome to carry. Anna on November 11, 2010 at 1:14 p.m. I LOVE these ideas! Love the idea of blowing one up with a straw to keep something delicate from smashing. I always pack liquids in zip locks, especially sticky baby medicines etc. Spencer on November 14, 2010 at 4:46 a.m. Thanks for the ideas. I'll bear them in mind next time I travel. Cynthia on November 14, 2010 at 7:59 p.m.
i totally rely on ziploc to save the traveling day. thanks for the post -- i got some good ideas. Nicole on November 17, 2010 at 8:44 a.m. I don't see why you have to have plastic ziptop bags for a lot of these uses. I travel frequently and use a wet bag or snack sack for my wet items (swim suit, moist wash cloth for wipes). A regular bag works just fine too. Or a plastic grocery bag. It just takes some foresight to pack extra bags. Heather Hapeta on April 5, 2012 at 11:20 p.m.
Michael Bromilow on August 15, 2013 at 2:40 a.m. 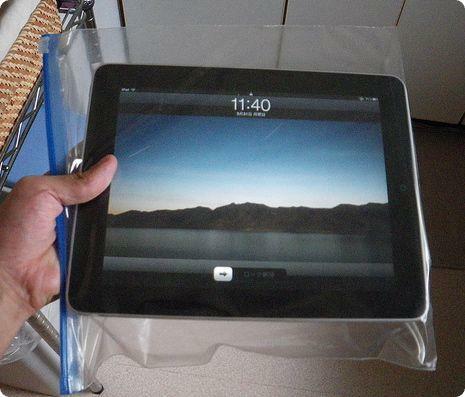 The ziploc bags don't always work as a waterproof case for iPads, phones, cameras etc. They will keep out splashes of water and possibly even a quick submerge, but where the zip it at the end of the bag, there is usually a small hole left. You can test if your ziploc bag is waterproof by filling it with water and tipping it into the corner of the zip to see if any water comes out. I tried some of my ziplocs and most of them had drips of water leaking out of them. Rinnie on January 7, 2014 at 6:19 p.m.
We've flown internationally with our kids & I usually bring ziplocks on the plane, different sizes. Airplane meals might be served when kids are sleeping, etc...so we can save the food for later. Also, when staying in a total that offers breakfast, we can keep an extra bagel, bread as a snack when we are out touring the town.